Well this is a different topic for me and something fun and new. It is called the Five Minute Friday Blog Challenge started by Lisa-Jo Baker. Every Friday she’s post a topic and then hundreds of people blog and supporting each other. Sounds fun so here I am. Laundry – what does laundry have to do with business you may ask? Everything if it is your business like a dry cleaner. Everything if it is essential to your business like a hotel. Everything if you want to look good as a professional. But seriously laundry is like many tasks in business it is always there (well unless you are naked when you do your laundry). Most of us don’t like laundry but we have to do it. And if we don’t do it regularly then it piles up and becomes a huge task. Hum, what in your business sounds like that? I know for me right now it is bookkeeping, I’m behind on it, I had a good reason but it is still piling up. Instead of being an easy weekly chore it has become a big activity. I will get it done but I know it is soooo much easier when I do it every week. What business chore do you have that should be a regular activity but has been put off so now it is a big project? A writing exercise bloggers from all over the world are doing today at “Five Minute Friday” with Lisa Jo Baker. We write for 5-minutes, no editing… and then we share! Same here – my income and expenses. I say every year I am going to set a day aside each month to do this task and I never do. I hate when we have to file our taxes late because I am not ready. Great to see you at Five Minute Friday, Heather! 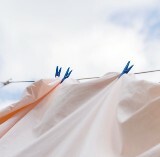 Laundry and business go hand-in-hand together, I believe… especially if you work from home. It’s a cross training, I think! Well, I agree with Joyce – it’s nice to see someone tie this writing exercise into their profession and challenge yourself with something new! You’re right, too. Laundry, in a general sense (and in a business sense) is very much like the things that pile up, always present, that we don’t want to do but can’t really get by without. Thanks for sharing your thoughts. Way to go with something new, and bonus points for tying it in! Great post!